About a year and a half ago I engaged on what would become a professionally frustrating though often personally rewarding new endeavor: a research project that moved away from my study of German foreign policy and took on the meaning and impact of the current information revolution on politics. This has been a meandering journey in many ways, and I’m still barely out of the starting gate. It took me into reading about consumerism, media history, a biography of Johannes Gutenberg, Walter Lippmann, Erich Fromm, Horkheimer and Adorno, numerous books on the financial crisis, and even some obscure thinkers like Rudolf Steiner, histories of the Roman Catholic church, the reformation, and psychologists like Freud and Jung. Each step of the way I was inspired by a different aspect of the issues at hand, or often by suggestions from fellow bloggers (Steiner and Jung came that way, for example). I have started numerous drafts, and even described my project in various blog entries, all of those starts later rendered obsolete as my thinking and reading progressed — or at times drifted — into new territory. Now I feel I’m finally under way. I’m not disappointed with how long this is taking me. I am a full professor with tenure. I do service and get good teaching evaluations. I am not in a publish or perish environment, so the pressure to get something into a journal is minimal. Ever since my book on German foreign policy was published in 2003 I’ve written a few chapters for books, did work on the scholarship of teaching, but have not been very prolific in terms of published research. Part of that is because on the same day I finished my final revisions on my first book my first son was born — followed two years later by another. The demands of teaching and parenthood made 2003 to 2006 a time frame with little time to do anything but get ready for classes and deal with the kids! But as the kids started to get old enough not to require constant attention, I realize I had to make a choice. Do I start trying to churn out articles on German politics or German foreign policy? I thought of some book ideas to investigate post-unification German foreign policy more fully, perhaps comparing German and Canadian policy, or looking at the dynamics of efforts to create a common European foreign policy. But I couldn’t get my heart into it. Others were spending a lot more time on those issues, and I didn’t want to bury myself in German language documents to try to come up with another manuscript that spoke only to a specialized audience. Instead I looked around at the housing bubble, consumerism, and then the economic crash. I thought about how profound the current information revolution is, rivaling the advent of the printing press in its scope. I co-taught classes with people from disciplines like Early Childhood Education, Art History, Music History, and Literature, adding to and complementing my Political Science background. I realized we are living in an era of crisis and transformation, perhaps marking the end of politics as we’ve known it. I also came to see that very few scholars are crossing disciplinary boundaries to try to come up with a multi-dimensional account of what is happening and what it means. There are a lot of creative ideas out there, but I decided I wanted to try to do something big. Rather than find safe publishable research topics, I’d go for something ambitious — an effort to come up with a multi-disciplinary understanding of what is happening in the world and what it means for the future. If I fail, it is no big loss. I’m learning and expanding my understanding of the world as much now as I was doing thirty years ago, and I’m doing so in areas outside of my specialty. That in and of itself makes this worthwhile, I feel I’m becoming a better teacher with a broader understanding of the world than if I’d focused on Germany (though my German skills have deteriorated a bit!) Unless the economic crisis closes down the University of Maine system, my job is pretty secure. There is no down side for trying something ambitious, I risk little. Perhaps colleagues will see I’m not publishing much and figure that since getting full Professor I’d decided to coast, but those who know me realize I’ve been possessed by an idea. The upside is maybe I’ll publish something that will be meaningful and relevant to a broader audience. Maybe this research will yield something important, maybe I can contribute through my work to trying to handle this period of change without the instability transformational eras usually entail. And if not, again, I’m learning a lot and thinking through issues that take me in directions I never thought I’d go. In the last month my thinking has coalesced around a specific project, with the thesis defined, the chapters laid out, and draft outlines being written. My goal is to have a draft at the end of the summer that I can shop around to publishers (or perhaps get some colleagues to react and then work on a second draft by the end of the calendar year). I see where this project is going, and I’m inspired. I feel like I’m at the start of a project I was meant to undertake, that my experiences set me up for this particular kind of work at this point in time. My blog postings may become more infrequent, or they may be motivated by what I’m writing about at a given point in time. This blog, in fact, corresponds to when I started moving to this kind of project. I had been keeping my own blog on the university server, brilliantly labeled “Scott’s blog” with no comments and minimal effort. In May 2008 I started this blog, wanting to record my thoughts as this era unfolds, in part for my children to know what their dad was thinking as the world changed. The title: “World in Motion: Reflections on culture, politics, philosophy and world events during an era of crisis and transformation,” reflect that attitude. So now, inspired, I jump into trying to bring this project together and work on a draft. And even if I fall flat on my face and end up with a project no publisher wants, I’m going to enjoy the journey! Power is a strange thing. Political power comes from having the capacity to control what others can say or do. In the US, that power rests on democratic principles; if anyone goes too far astray in exercising political power they are punished at the ballot box. In authoritarian societies power rests on a calculation: citizens must be satisfied enough and fearful enough to decide that going along with the regime in power is better for them personally than protesting or acting against it. The leader has two major threats. The most immediate is from other elites. Having power in a country like Libya means numerous perks and advantages, thanks to the oil revenue the country brings in. Other elites would like that power, power draws ruthless people like moths to flame. So a dictator/authoritarian must make sure he is surrounded with security forces loyal to him, and that enough elites benefit from his largesse to the point that they would choose not to risk it all by challenging the leader. Moreover, they would also oppose the challenge of another, since the other is not guaranteed to continue that largesse. Job one, therefore, is to buy the loyalty of elites while maintaining a strong security force. The other danger, that of popular rebellion, is easier to prevent. Severe repression, including imprisonment, torture, beatings and even death, send a message that resistance bears a high cost. A strong security force with an extensive domestic spying network can pretty much break up any challenge that might start to arise. Individuals don’t resist because they know it will lead to no change in the system but could destroy their lives and families. On top of that, leaders can make people feel comfortable enough — assure basic services, social welfare benefits, and security — that they citizens accept the rationale that the government means stability. Without it, who knows what kind of chaos and horrors could ensue? Gaddafi apparently had that calculation right for 42 years. Building a cult of personality around himself, connecting with foreign leaders, and buying off the support of tribal chiefs he essentially eliminated the idea of a coup from within. Keeping the public satisfied seemed easier. He felt untouchable in his control of Libya, even after it became clear that his early dreams of uniting the Arab world under his vision of pan-Arabian socialism wasn’t going to happen. He staked out a radical anti-West position, held out against pressure after it was discovered Libya was behind a terror attack against a Pan-Am flight that exploded over Scotland, and leveraged oil resources to bring the West to a grudging acceptance of his rule. Like Mubarak, however, he didn’t see the domestic world changing around him. This is also similar to the case of Communist leaders in the USSR. Despite warnings from below that the economy was collapsing — in the 70s the Soviet KGB warned that their economy would disintegrate within ten to twenty years — the leaders felt comfortably in charge, buoyed by their international status. In the case of Communism the change was brought by an economy that was fundamentally flawed and unable to innovate or grow. In the Arab world demography and technology were key. Gaddafi had controlled what his people heard or saw of the outside world. State TV and the press told the government’s side of the story, few people looked elsewhere. Moreover to his generation he was a nationalist hero, someone who overthrew the King and fought against the last vestiges of colonialism. He kicked out the remaining Italians, and seemed to symbolize Libya for the Arabs rather than the Europeans. A desire for security and stability was strong in that generation, and their docility was easy to buy and maintain. Even if they soured on his leadership after awhile, they were used to it, and it seemed the norm. The youth rising up, however, do not see Gaddafi as a symbol of anti-colonialism, but rather of corruption and repression. They also realize that the vast oil revenues flowing in too often went to Gaddafi’s personal ambitions, be they building projects at home, adventures in African conflicts, or building a large military. The oldest of this new generation led a push for more contacts with the West, something that seemed harmless enough, and would bring more money into the country. The younger, however, embraced this alongside real information about the outside world. As in Egypt al-jazeera brought images of what life could be like (Presidents can be elected rather than simply serve for life! ), and laid bare the corruption and stagnation in the Arab world. Resentment grew and all it took was a spark. Tunisia was that spark; unexpected and sudden, it told the youth that apparently embedded dictators could be overthrown. Technology helped overcome the state’s usual calculation that repression could thwart any protest. Through social media such as facebook and twitter enough people could gather that would get notice — and not be easy to put down. Once a critical mass is reached, such opposition becomes ever harder to put down. The state starts crumbling. That is where Libya is now. Yet Gaddafi is unable to accept reality. He is so used to power and authority that he and his family cling to it at all costs. His honor and dignity, already sacrificed, seem more important than his country and the lives of Libyans. Power has numbed him to ethical principles. Power is all that matters, he is addicted to it, he’d sooner go down in sea of blood (he’s used that image) than recognize that the world is changing and his time is over. 42 years of power is an impressive run; he’s old, certainly he could find a place of refuge to live out the remaining years in relative comfort. But no. He can’t imagine that. He sees himself as indispensable, entitled to lead Libya, and betrayed by foreigners and nefarious media organizations. He likely doesn’t understand the youth dynamics, he’s been isolated from the common folk for four decades. The Libya he thinks exists has changed. His state media put out claims that al qaeda is controlling the East (to scare the Europeans) and tries to wrap itself in the anti-colonial symbols that played so well for him in the 1970s. The people tune it out, they know state television is rubbish. So now we watch as the body count rises, violence grows, and people try to figure out what to do about the situation. Do we intervene, or would that make matters worse? What about the rising cost of oil, and the chance this could spread? One lesson is clear though: power not only corrupts, it addicts. The wave of unrest and revolt sweeping the Arab world has spread to Libya, a country which lies between Tunisia and Egypt. This goes along with unrest recently in Yemen, Algeria and Bahrain. In all cases the situation is fluid and government violence has sparked anger. But while the numbers injured or killed remain relatively low in most countries, Libya’s 42 year long dictatorship under Muammar Gaddafi is striking back with force. Reports are that Libyan military aircraft are bombarding protesters and African mercenaries have been hired to slaughter them. Libyan diplomats and officials are resigning in protest as the Gaddafi regime digs in, with Gaddafi’s son Saif al-Islam vowing that they would fight against the unrest, noting that Libya is not Egypt. In the UN talk grows of war crimes being committed, while Lord Owen, former British foreign minister, openly contemplates military intervention. Simply, this regime seems determined to use its power to do everything possible to avoid falling. Yet the people do not seem to care. As in Egypt, the prospect of death and injury seems worth the risk to those who want to rid Libya of a dictator that is not only brutally repressive, but also has squandered oil wealth on his own pet projects of building a large military and involving himself in African conflicts. He’s been oblivious to the changes in Libya, ignoring the “youth bubble” – the median age is 24. If Gaddafi falls, then its a clear sign that the day of the dictator is over in the Mideast. With oil wealth, it was assumed that Gaddafi, like the Saudi royal family, had the capacity to buy off enough people and isolate his regime from public pressure. If the Libyan revolution succeeds, it is a strong sign that this will continue to spread, remaking the Arab world. At this point, it does not look likely that Gaddafi can survive. Yet if he has enough troops loyal to him he could try to spread chaos, sabotage Libya’s oil industry, and create a situation where civil society falls apart completely. In a worst case scenario Libya could become like Somalia. Gaddafi would have his revenge on the tribes that he believes betrayed him, and if oil prices climb due to his sabotage, get back at the West for their support of the uprisings. Like Mubarak, Gaddafi blames al jazeera. To the dictators Al Jazeera is a trouble maker, trying to stir up political dissent in a way that is irresponsible and disruptive. Authoritarians hate a free media. Just as the US was mad at the Qatari based news agency when it reported the truth coming out of Iraq, even bombing the station’s Baghdad facilities and killing one reporter, Gaddafi considers the satellite news outlet to be an enemy. Gaddafi extends his propaganda to criticize Qatar’s government, claiming the Qataris are using Al Jazeera to topple governments in the service of the United States. People like Gaddafi don’t understand how the world has changed since the days when state run media could control what people knew. A mix of propaganda, state spending and repression could keep a country subdued. After decades of power they came to believe their own propaganda, seeing themselves as legitimate and even indispensable leaders. As Louis XIV said, “L’etat c’est moi.” They blame Al Jazeera as a nefarious and evil agent of subterfuge, when it is really a symbol of how the world is changing. Nobody believes the propaganda any more, especially not the youth, and more than ever they are willing to die to try to force change. Word early Wednesday morning (Libyan time) is mixed. Gaddafi is said to be ready to use all force at his command to crush opponents, including the air force, bombardment from ships, and the military. He cites China’s Tienanmen Square military action of 1989 in positive terms, and he and his son Saif show no hesitancy to blame the Americans and pretend to represent the true Libyan people. On the other hand, word is that the state is collapsing, the military is not loyal, and countless diplomats and government officials are resigning. Libya’s former Interior Minister Abdul Younis, who just resigned, claims Gaddafi tried to have him killed so he could blame it on the protesters. Supposedly Gaddafi is not so much defiant as frightened, desperate and out of touch. Even the most defiant and resilient leader cannot hold out when the military and state bureaucracy remove their support. If the people remain steadfast, and pressure from the international community is real, those important actors will recognize that Gaddafi represents a regime that has become obsolete and that they are better off siding with the protesters. What this means for the region is unclear. Europe modernized over centuries, with bloodshed and rivalries tearing the continent apart. The US modernized in relative isolation, though its superior technology seduced the early Americans to conquer natives and violently expand. Modernization and democratization have always been messy processes, and usually not successful right away. Reactionary forces will also strive to halt change, such as Islamic fundamentalists. Still, one shouldn’t begrudge the Arab youth their optimism and idealism. They have to overcome a legacy of violence and oppression, and economic reality doesn’t change over night. Once Gaddafi’s anti-American anti-Western tirades won him praise from many corners, and were enough to convince his people that he represented an Arab defiance of the past colonizers. Now as the defiant yet obsolete Gaddafi trots out those old bits of propaganda demonizing the US and the West he simply looks pathetic and out of touch. The world is changing, get ready for a wild ride. Given what I wrote in my previous blog entry Free Will, as a father with two children ages 5 and 7 (nearly 8) one of my biggest concerns is raise them to be as little afflicted by the anxieties, depressions, insecurities and stresses of the modern era. Most parents worry more about things like a work ethic, moral values, manners and protecting kids from bad influences. Of course those things matter. But I don’t want to program them to uncritically adapt to the culture around them, or to lack the confidence to think for themselves and challenge authority. That starts at home. The interesting thing about the problem with the enlightenment Fromm and others from the Frankfurt school investigate is that it’s symptoms come forth through individual psychology. If modernity sets up barriers to feeling content, satisfied and valuable, it does so by making it seem like these traits are of scarce supply. Only a few people get a profession that renders them ‘valuable’ by dint of their pay checks. Contentment and satisfaction are defined in material and relativistic terms. That means that there is always something else to strive for, both in terms of possessions and self-identification. People see others with more stuff, or who seem to command more respect, and they often feel discontent. The main symptom of this when people obsess that they are “missing out.” Others have it better, others enjoy life, are treated well, and are able to do things that they can’t. Instead, you explain the reason clearly, and find an alternative special activity for the one who is missing out, and he will experience the bigger mountain, just not this time. The idea: you may not get the same thing, but you each get something special. This is equality of status. The problem with the modern world is that status is determined less by intrinsic human worth or even ones’ contribution to society. Instead, it is determined by wealth and prestige. The trash collector is extremely important to society — just visit a city like Naples a few years ago when the trash collectors were on strike — but their status is low in both pay and occupational prestige. A point guard in the NBA is relatively unimportant for the functioning of society, but their pay and occupational status is quite high. Moreover, this is seen by many as good because it gives incentive for people to compete — if you don’t want to feel like you’re missing out on something or that you aren’t as worthy as a human, you need to prove yourself in competition and comparison to others. Those with self-esteem problems will find this a daunting task, since every instance of not being on top will be seen as a source of insecurity. But even with perfectly normal people this sets up a trap. Only a few people can have high pay and prestige, by necessity those positions are limited. Yet it would be a nightmare in psychological terms if the vast majority who don’t make it to the top felt they lacked value and status. So one solution to this problem of the enlightenment is to find a way to achieve status equality. The social scientist in me wants to think about this in sociological terms — what kind of social reforms might make status equality possible? Clearly its not forced equality of wealth, though perhaps European social welfare states might come close by assuring basic minimums are met for everyone. As a parent, however, the question is different. Given that the world is what it is, how do I prepare my children to go into the world with a strong sense of self-confidence, knowing that they don’t have to be on top? Moreover, this is not something that can be forced. Every child wants to win, trying to repress that, or doing things like just having non-competitive games is pointless. So the answer can’t be to somehow try to repress that natural drive, that would only lead to other problems. Ultimately what one has to do is de-couple individual worth from cultural definitions of success and status. There is only one way to do that — an individual has to have the power to assess and accept that he or she is successful and valuable regardless of wealth, social status or how one fits in. The individual has to be able to define success in his or her terms, determine how to achieve it, and then see that as real, not cultural expectations. That’s the way the modern world is. The connection to nature and community provided a “natural” status equality even in hierarchical systems. Since the peasant didn’t aspire to become nobility — that was not possible and represented God’s natural order for the universe — status within the peer group is what mattered, and that was generally equivalent. And while friends and a strong sense of nature are powerful means to cope with the anxieties of the modern age (indeed, necessary means to cope) the core responsibility now rests with the individual. For parents, that means raising children in a way that allows them significant creative room to play, explore and learn independence. Without an independent spirit, a person loses the capacity for self-valuation. Confidence comes not from strict rules, protective parents, and messages that success is conformity. Confidence comes from being able to make as many decisions on ones’ own as possible, and to see parents not as disciplinarians to be obeyed, but as guides to be listened to. That’s not easy. That means that as a parent I try to banish the phrase “because I told you so” as much as possible! Simply, “freedom from constraint” was only one step on the path to the enlightenment project of human liberation. The ability to handle this freedom requires an ability to take full responsibility for ones’ own life, and that requires that children be allowed to develop truly independent personalities. That’s only the first step, but a necessary one. Seeing oneself as a victim of forces beyond ones cultural makes it virtually impossible to achieve contentment and joy. In my Honors course we’re reading Erich Fromm’s Escape from Freedom, one of my favorite books. It raises questions about the nature of freedom and life in the modern world, essentially arguing that the enlightenment goal of human liberation is far more difficult to achieve than the enlightenment philosophers believed. The problem comes from the fact humans are, by nature, not completely discrete separate individuals. Humans have individual identity, but also rely on “primary bonds” connecting the individual to both nature and community. How we think, our psychological well being, and our sense of security of self relies on these bonds. Up until the time of the enlightenment this was not problematic. Humans lived with, relied on and were connected to both nature and community. Enlightenment thinkers, however, took as their mission human liberation. Humans have been tied down by religion, tradition, irrational cultural norms and wealthy leaders for too long, they argued. Humans should be free to use reason and rational thought to make their own choices, freely acting in the world, responsible for the lives they lead. In theory this sounds great, but human liberation in these terms also meant destroying the bonds of community and nature that are so important in providing meaning to human life. Simply, the enlightenment’s quest for liberation over simplified the task by thinking all that was necessary was to break free of constraints on liberty. They didn’t recognize the psychological impact of that move, and how breaking these bonds actually creates real hardship for individuals. Yet Fromm and others from the Frankfurt school don’t want to reject the enlightenment project. Human liberation is still the goal. But “freedom from constraint” is not enough to achieve it. Unless we can find a way to replace or compensate for the loss of those bonds (nature and community), the psychological cost of “freedom from constraint” is so high that it often creates negative personal and social consequences. Fromm’s focus was the rise of Nazism, as the fascists provided an apparent answer to those psychological dilemmas — ultimately a false answer. I’ve already discussed how identity is not just individual, but also a social construct. This leads to at least three problems associated with the nature of modern freedom. First, our actions, driven by subconscious drives spurred by the alienation and anxiety caused by having our bonds with nature and community broken, create a system that in some ways is above us, a new kind of God. We conform to the system, and what gets defined as normal and acceptable gets taken as natural and true; we lose our critical insight, we think that the world as we experience — our “common sense” — is valid. Other ideas (or cultures) are thus strange and bizarre. As with hypnosis society’s suggestions can form the way we think, what our preferences are, and even our core values. We think we are free rational choosing individuals, but can become (in varying degrees) conforming automatons, programmed by a society created by those who came before us. Second, we construct our own “magic helpers” as Fromm calls them, to place our faith in and to find meaning from. This doesn’t have to be a religion, but can be an ideology or principle. If you use an abstract set of principles or an ideology to make decisions and determine life’s meaning, you’ve counteracted the impact of freedom by creating a new “truth/God” to adhere to. Unlike the original bonds of nature and community, this truth is abstract and subjective (even if one thinks the principles are universal and objective). It can lead to extremes, and exert itself as an authoritarian personality. My principle is right, all others should adhere to it or they are wrong, and thus need to be stopped! I will follow my party, leader, nation, religion, or whatever authority I now hold high, wherever it leads! This is the core cause of fascism, as well as religious and ideological extremism. Finally, we are easily manipulated by those who possess wealth and power to think a certain way. Just as the system’s “common sense” can program us, marketers, political leaders, media outlets and others can actively construct a world view. For instance, Fox viewers in a recent poll are twice as likely as others to fear Sharia law. Now, there is absolutely no threat that sharia law could be imposed in the US for a variety of reasons. But over 40% of Fox viewers fear it because that media outlet has people on who paint it as a real threat. That statistic alone shows how powerful the media can be in shaping opinions! The manipulation is often subtle. Most marketing is NOT directed at affecting your rational choice — giving information to help you decide what to buy. Rather, the goal is to tug at your emotions and get you to feel a certain way. When you drive buy McDonalds with your family the emotions generated by the feel good family commercials for McDonalds, hardly mentioning the food at all, can create a certain “will” to choose to eat there with the family. They know that, marketers admit that is what they go for, and yet most people believe their choices to be rational and objective. The solution — re-establish bonds with nature and with community (others) — seems simple enough. Indeed the rise of social media seems to come from that desire to have community. But the bonds need to be positive (they help us have security and a sense of wholeness) rather than negative (driven by anxiety and insecurity). That’s what is difficult. The modern world can be cold and isolating, our consumer culture defines value in material terms, and success by the money you make and the products you own. With unnatural and even manipulative bonds being offered (such as ‘branding’ – identifying with a brand name) it’s easy to get lost in a culture in which the freedom to define yourself is a herculean task. In my next post, I want to address possibilities along those lines. We can’t go back to pre-modern communal structures and cultural authority. Indeed, I would not want to go back there. I am an individualist, I want to be liberated, not manipulated or forced to follow traditional cultural norms. Yet I am a human, and as John Donne noted, “no man is an island.” I am not fully human if disconnected form nature or others around me. The key both for individual peace of mind as well as for having a stable society is to find a way to have healthy “natural” bonds replace those destroyed by modernism. After being glued to the news during the Egypt demonstrations, I’ve been scrambling to catch up all my work, even as protests spread around the Mideast. Governments have learned from Egypt, they are trying to crush the protests early from Bahrain to Yemen and Iran. But that’s not the subject of today’s post. Here in Maine we’re deep into winter. This is good. Mt. Titcomb here in Farmington has superb skiing and is a very inexpensive family oriented mountain. My recently turned five year old son can now ski down the mountain from the top (he still needs help on the T-bar), while my seven year old is attempting black diamond runs. I find myself utterly and completely awed and emotionally fulfilled by the beauty and joy of skiing. It’s a kind of giddy exuberance, the colors, the crisp winter air, the views, the feeling of speed and control gliding down the mountain. I once likened skiing to something akin to a religious experience — movement, control, beauty and speed combined — to me its a transcendent sport. Not that I’m an expert (heck, I won’t do some of the things my seven year old attempts), but it is one reason I’m glad I live in Maine and no longer in South Dakota! But in three months it will be May 16th, and along with 43 students and three other faculty, we’ll be leaving for a two week travel course to Italy, visiting Venice, Florence and Rome alongside some day trips. Besides skiing, I love teaching, and despite having no strong belief in an organized religion I feel extremely blessed to have a life filled with things that bring me joy and satisfaction. Travel courses reflect the ultimate teaching and learning experiences. Teaching and learning always come together. In every course I teach I learn more, often pushed by student questions and ideas, or simply in preparing the course. This involves both the subject matter and the art of teaching itself. Teaching travel courses solo, something I’ve done twice, pushes me to learn about aspects of the trip I’d otherwise not be interested in. But teaching with others is an intense experience where learning and teaching mesh, we are all travelers, all learning. Two weeks in a course like that is more valuable than a semester in a class room. Moreover the learning isn’t through lots of passive reading and listening, but active discussions and explorations. Exploring the food, sites and culture of another country is for me even more joyful than skiing since it engages me intellectually and provides a freshness of experience that adds some zest to life. When you travel you also leave everything else behind, all other projects and demands are forgotten, all that matters is the daily experience. It’s an invigorating and rejuvenating experience. A lot of Americans get caught up in the trap of thinking that money not spent on a material object that one can have sitting in the corner or available for use is money wasted. Travel is not a priority for many because once the trip is over all that remains are memories. Yet while material objects often sit in the corner unused, travel changes lives. The experience stays with a person. One appreciates culture at a deeper level, and recognizes that what seems natural and normal in one culture may be strange in another. One appreciates new things and casts a more critical eye on what once was taken for granted. It adds a richness to living that never goes away. Students often say their travel courses (or study abroad experiences) were the highlight of their education, the part of their study that had the most impact on their future. Perhaps that’s why travel becomes addictive; once people discover its true quality of life value, just getting more “stuff” is seen as a less satisfying use of money. Travel courses also keep things fresh. One time we started our first walk in Venice. I’m looking around, appreciating the city and feeling good to be back (the upcoming course will be my sixth to Italy) and suddenly students are zipping by me, running for something. I look around, trying to figure out what’s happening and I realize that they are simply awed by the canals and running to a spot to take photos. Then I remember how the canals looked to me the first time I saw them; I can see Venice through their eyes, and not take the canals and alleyways for granted. Watching students discover the culture, the food, and revel in the experience (and then write back ten years later that they just read their travel journal and relived the trip, thanking us again for the experience) is immensely satisfying. To be a part of making that happen gives me a sense of pride. This May I will blog again (I did so back in February 2009 from Italy, and last May (albeit fewer entries) from Germany/Austria). But this time I’ll blog only about food. I’ll document the culinary experiences of the trip, perhaps in short posts. I’m already looking forward to the tastes of Italy! But for now, it’s still winter, and still ski season! Friday I came to my 9:15 World Politics class with an apology. Due to my late night obsession with events in Egypt, I had forgotten to write the quiz they were supposed to take. They didn’t seem to mind. And for the past week, this has been an obsession. 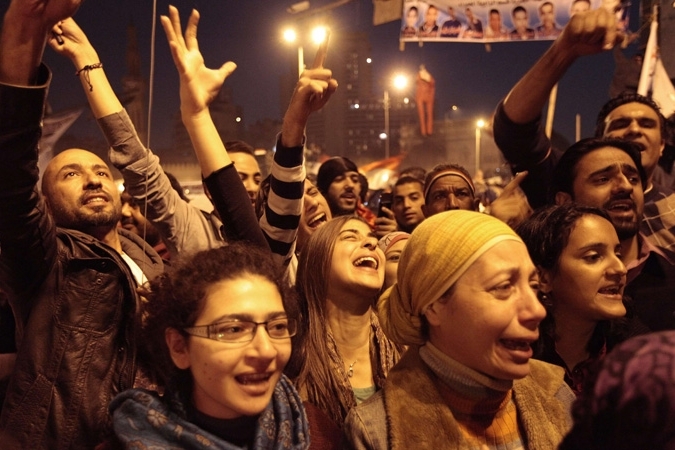 Following al jazeera streaming video and reporting, watching events unfold in what I’m convinced is the start of an historic transformation of the Arab world, it’s hard not to be caught up in the emotion of the millions celebrating at Tahrir square in Cairo. The news of Mubarak’s resignation was timely. I was about to go participate in a panel discussion about Egypt (which drew a nice crowd) just as the news came out. Some colleagues had al jazeera’s live video stream on the screen before the discussion began. We were watching history. It’s hard to over state the importance and drama of the Egyptian revolution; it may be for the Arab world what the French revolution was for the West. Therein lies the problem. The French revolution, also greeted with relief and hope by enlightenment thinkers, didn’t turn out so well. The rule of an autocratic Monarch gave way to chaos and ultimately Napoleon Bonaparte, who would craft a French nationalism that would allow France to conquer Europe for a time. But Egypt isn’t France. Egypt isn’t Iran. Egypt isn’t Berlin of 1989 either. The path forward is unclear and difficult. For the Arab world to truly progress a few things need to happen. First, real democratic reform must take place, and the people must work to assure they aren’t hijacked by well organized extremist groups. This will require the military perhaps moving faster and with less caution then they’d prefer, and the people will have to have more patience and trust in the military than they’d like. The military in Egypt is a key player in this; as in Turkey, the Egyptian military could make democracy it’s goal, while at the same time preventing it from collapse. Second, we should get less caught up in the debate about “secular” vs. “religious” groups and think more broadly about the development of a true civil society. Technically civil society is defined as people voluntarily participating in social and civic organizations. But millions taking to the street to demand change is also a strong indication of a potential civil society. The key is to turn that desire for change into effective long term efforts to make Egypt a vibrant society. The emphasis of especially western scholars on voluntary organizations is only one aspect of civil society. It misses the core issue — why it is that people might choose to get involved. Civil society is constructed first and foremost on a series of shared beliefs and understandings about society and the role of both the individual and government. Polities can function well even with very different governmental structures if the underlying shared norms and values fit with how the country operates. Social democracy works well in Sweden, but probably wouldn’t work in Alabama. That also explains why ideologues tend be wrong about politics — they try to use reason to figure out the right form of government, rather than recognizing that a government has to fit the culture to function. To truly change politics, culture must change. Otherwise, you need force to prevent things from simply reverting to what they were before. In Egypt the new generation — half the population is under 24 — has a very different set of cultural values than their elders. That’s why Mubarak and Suleiman were so clueless; their message of ‘stability and security’ spoke to an Egypt that is fading away. The new generation wants opportunity, freedom, global connections, and a voice. They now know they can change the world when they unite. That’s why it is misguided to raise dire warnings about the Muslim Brotherhood or expect the extremists to benefit from this Arab transformation. The Brotherhood has a charter that sounds pretty extreme, but its make up is diverse, and in recent years has been moderating. Yet there are extremists amongst them, and a number of them would love to take whatever new freedoms are emerging and radicalize the youth. Their dream is that the Arab youth embrace fundamentalist Islam. That’s not going to happen. Even in Iran where the Muslim clerics hold power, the people are not with them, especially not the youth. In the Arab world groups like al qaeda have also been rejected. In fact, it was probably torture and oppression at the hands of people like Mubarak that helped fan Islamic extremist flames in the first place. Given the rise of al jazeera and the desire of the youth for opportunity, the only way for extremists to gain traction is if a global depression creates true economic catastrophe in the Mideast. The West can help by encouraging true acceptance of Muslims in our societies, modeling religious tolerance, and allowing western Muslims, who are mostly modern and anti-fundamentalist, to come up with a coherent theological counter to the extremists. They can even find it in their own past, before the Ottomans enforced a reactionary conservative Islam, Islamic rationalists saw the Koran as a human product, to be interpreted differently in changing times, and subject to human reason. It will be a difficult transition, the extremists will try to create instability and enemies, maybe lashing out at the West hoping create a conflict that will spread chaos. As long as we don’t let them goad us, they have a losing hand. 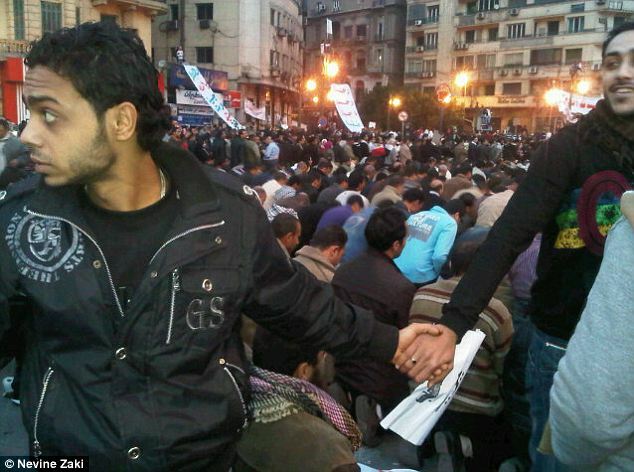 The image below is powerful; Coptic Christians encircling Muslims at prayer time to protect them from the police. Interfaith collaboration and cooperation can help all sides focus on the common values they promoted so powerfully in the last three weeks. Perhaps I am too optimistic. It’s hard not to be moved by millions of people demanding liberty and democracy, willing to suffer long uncomfortable weeks of protest, to risk death (and many did die) and torture, and then to erupt in joy when the tyrant backed down. Yet if one cannot be optimistic about this, what does it say for the values we as a country hold true? As was the case in 1989, the most moving aspect of this revolution is that it came non-violently from the people deciding they would no longer tolerate tyranny and oppression. When the people unite, they can bring down any government or ruler. The hard part is not to loss patience or interest during the difficult transition. There isn’t a lot the US government can do, but governments may not be as important as they used to be. We all can connect via social media, promote the values we believe in, make our voices known and recognize that the Egyptians have shown us a glimpse of what the new order could become: power to the people.